Looking for a fun way to earn extra money? Try working as a brand ambassador. I always recommend brand ambassador gigs to people who’d like to do flexible work, earn more than minimum wage, and don’t mind interacting with people. I did a wide variety of brand ambassador work for 4 years, and the jobs I did were super flexible and helped me balance my busy schedule, which, at the time, included going to school and taking care of my son. 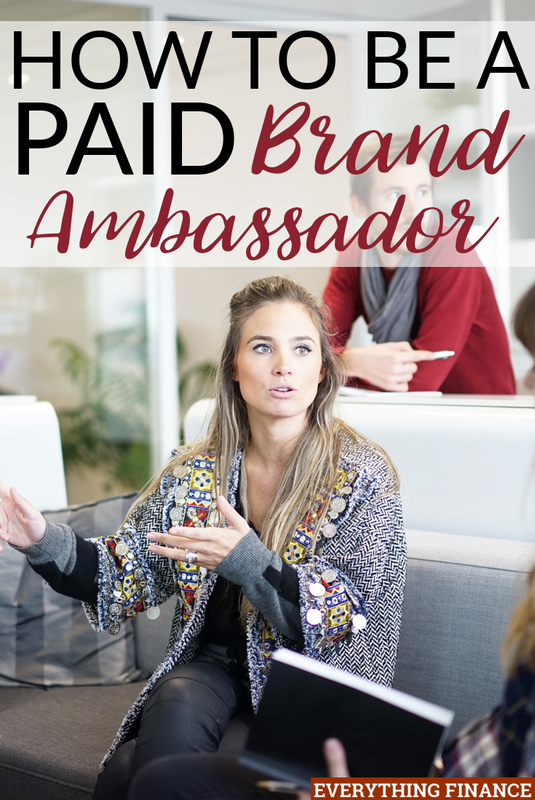 In this post, I’m going to share everything you need to know about landing brand ambassador jobs to earn extra money. So What is a Brand Ambassador? A brand ambassador is someone who often does live demonstrations to represent a brand and drive sales to a certain product or service. If you consider yourself a shy person or an introvert, don’t run away screaming just yet. I consider myself an introvert, which is why I leaned more toward brand ambassador jobs that weren’t high sales pressure and didn’t require me to get in front of a large crowd and present to them. Some brand ambassadors work at events and talk to large groups of people when they are trying to share information about the product they are representing, or are demonstrating how it works, but others just set up a table in a store and start handing things out to people who walk by. When I worked as a brand ambassador, I prepared a lot of in-store food samples, and since people love food, they were naturally drawn to come up to me to see what I was making and talk to me about the product. How Much Can Brand Ambassadors Make? It really depends on the type of work you are doing. Most gigs pay well over minimum wage. When I was doing in-store food demonstrations, I was making about $11/hr, but when I did alcohol tastings in the store, I made $25 per hour. According to PayScale, the average hourly rate for a brand ambassador is $13, but I know plenty of gigs that pay more in the $15-$16/hr and up range. Some companies even hire people for special campaigns, especially around the holidays, which can pay pretty well. I recently saw an opening for a Keurig campaign that paid $100 a day for a 6-hour shift, and the brand ambassador got to keep the Keurig machine at the end of the job. Bonuses may also be offered if you sell well. The main point of this job is to drive sales, but it’s also just about brand awareness. When I did in-store demonstrations, we were encouraged to ask customers if they’d like to buy the product. We got praised for sales, but if we didn’t sell anything that day, it didn’t really affect our pay, and we weren’t punished or fired. We were still paid our regular hourly rate regardless. However, another brand ambassador job I had paid me a flat rate of $10/hr to work 32 hours per week, and they also paid out big weekly bonuses depending on how much product I sold. If you’d like to start working as a brand ambassador, you’ll need to apply online with a company that provides work opportunities in your area. There are two different routes you can take. You can apply with a company that will provide you with consistent work based on your availability, or you can apply with a company that sends out notifications for regular gigs that you can bid on. I’ve done both options, so I can shed light on some of the pros and cons. Companies like Advantage Solutions provide jobs nationwide that allow you to work regular 6-hour shifts in stores like Walmart and Sams Club. Stores like Costco and Meijer also hire their own people do to in-store product demonstrations, and it’s very laid back and low pressure. Some popular companies for bidding include On The Rocks Models (alcohol tastings) and Big Orange Productions. These companies tend to offer gigs that pay more, but when something is available, you have to respond to their notification emails to request the job. There’s usually no guarantee that you will be chosen, but on the bright side, there are always a good amount of gigs available, and you can choose which ones you’d like to take. If something is too far from your hometown, or you don’t have the spare time to take on the job, you don’t have to bid on it. Of course, with this style of securing work, the amount of money you earn can vary quite a bit month-to-month, but it’s still a good option to earn extra income on the side of your main job. Luckily, you don’t really need any special training or a degree to get hired to do this type of work. When I applied for my first brand ambassador job, I simply put on my application that I had experience cooking at home since it was for a food demonstration position. If the company you’re working with wants you to earn a specific certification or receive training, they will provide you with it and they should pay for it as well. It’s important to know what you need to bring on the day of the event in order to be fully prepared. Some companies want you to dress professionally with black pants and a white button-down shirt, and they may even ask you to bring some supplies like a table and table cloth. Sometimes, you may be mailed a kit with instructions and coupons and swag to give out during your event. Most brands will also send more information about their product and selling points to mention to customers so you can better engage with them. It’s important to realize that you may be responsible for paying taxes on the income you earn. If you receive checks from the company you work for and no taxes are being taken out, check your status to see if you are an actual employee or an independent contractor. If you do have to pay your own taxes for the income you earn, make sure you track all your income and expenses carefully. Talk to a tax professional to see if you can write off any expenses like money spent commuting. Many brand ambassadors are required to take a few pictures during the event and complete a brief report following the event to offer feedback to the brand and share information like sales estimates, how many people stopped by, etc. The good part is that this report can often be done easily online. Just don’t forget because most companies won’t issue payment until you’ve done your post-event report. All in all, being a brand ambassador can be a fun and flexible way to earn extra money. Even if you’re not an extrovert, you can still enjoy the job. There’s plenty of downtime and you’ll meet a ton of great people who stop by to learn about what you’re doing. Have you ever worked as a brand ambassador? Would you consider doing it as a side hustle?